Suspending banners over roadways requires careful consideration of the restrictions and standards that are set forth by most local governments. Over road banners usually require extra hardware and reinforcements to make them safe enough for pole to pole installations. Almost all over road banners will need city or county approval and it is best to check with your respective city for their specific requirements regarding this type of banner before ordering. 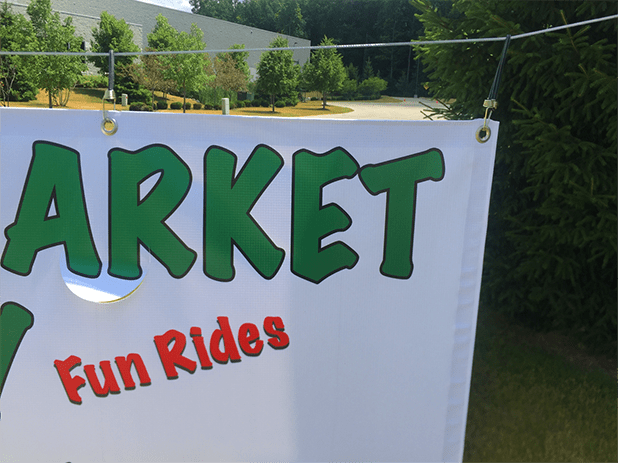 These banners can be single or double-sided and printed at any size necessary on various weights of vinyl banner material. Double-sided over road banners - we use our 18oz. heavy weight vinyl. This is a rugged and durable blockout banner material that is specifically designed for optimal strength and ideal for outdoor installations, even in harsh	weather conditions. This 1000 x 1000 denier media is the right solution for long-term displays in all types of stressful environments. Single-sided over road banners - our 8oz. mesh vinyl material provides high image quality with fine details while remaining a great solution for windy locations which may cause traditional banners to tear. This perforated material allows air to flow through it, creating a perfect solution for long-term displays in high wind regions. For any type of event that will benefit from the maximum amount of exposure possible, suspending a banner over the street is a great way to advertise. Over road banners are viewed at a much higher percentage rate than a vinyl banner along side the street. 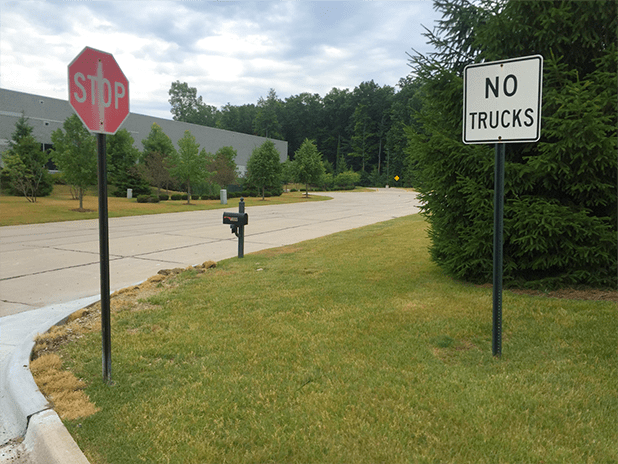 Most communities allow over the street banners with a permit, however, because of liability issues, over road banners need to be made properly and usually have certain requirements necessary for approval. 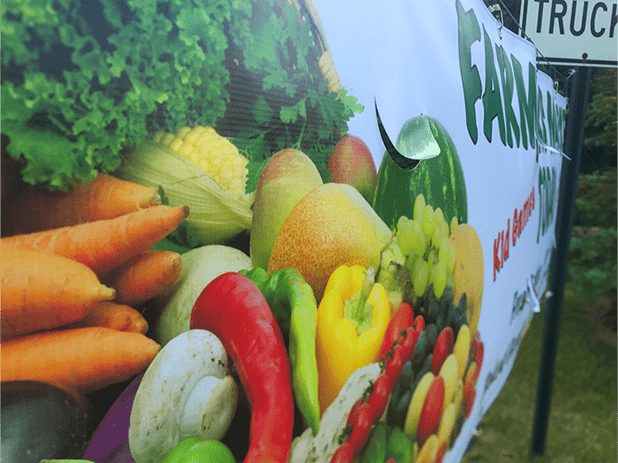 These extra-large or over-sized banners can capture the attention of thousands of motorists everyday to promote virutally any type of upcoming event or gathering. Community Events - Promote upcoming or annual local events like fairs, community happenings, and much more. Welcome Banners - Extra-large over-the-street banners can be used to greet guests both coming and going. Information Banners - A large banner that identifies your company at trade-shows, exhibitions, conventions and more. Auto ShowBanners - Go big to highlight sales, promotions or just display a company name for easy visibility. Expositions/Events - Nice, large banners get attention, give directions, inform, identity and decorate at big events. When hanging a banner over the road, it is important to consider all of your local city requirements. Before ordering, it is best to place a call to your local officials in order to best understand your specific ordinances. Do I need to check with my city before purchasing an over-the-street banner? Since over-the-street banners will be spanning the gat between two free-standing objects over a road, many cities have very specific requirements to meet safety regulations and insure the banner is built properly and installed properly. Giving your local city government a call and inquiring about specific over-the-street banner requirements is always safer than assuming - if the banner doesn't meet the regulations, you may not be able to hang it or have to spend more money on a new banner that meets the requirements. What are some of the special requirements an over-the-street banner might need to meet? 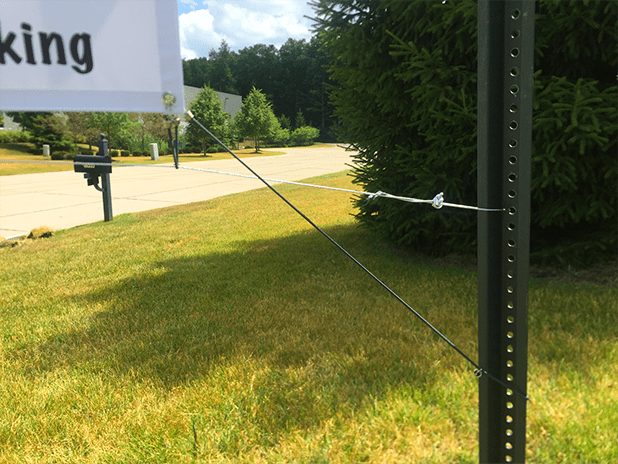 Some of the more specific requirements that can complicate the production of an over-the-street banner include special heavy-duty material, pole pockets to allow the banner to be tied off with rope or cable, reinforced edges for banner stability and strength, grommets installed in a specific pattern to accomodate an existing cable display system. Some cities may also require wind-slits to allow air to pass through the banner more freely as well. What is a typical over-the-street banner size? 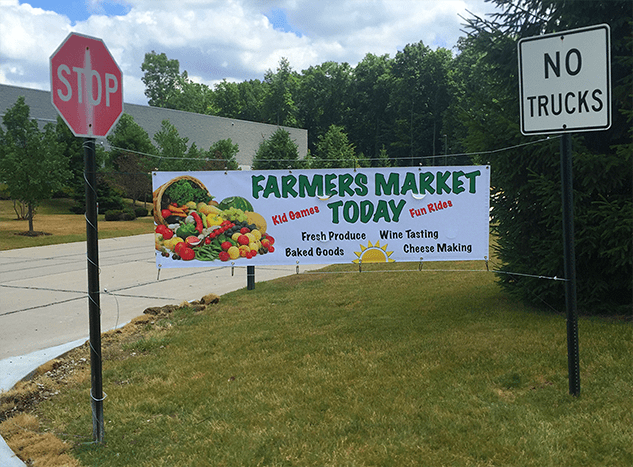 Most over-the-street banners are 24" to 36" inches in height with lengths varying from 20 feet to 45 feet or larger. It really depends on the amount of text on the banner and the width of the road. Your message needs to be large enouch to be visible to passing motorists and foot traffic in addition to meeting city ordinances. Are all over-street banners double-sided? Typically over road banners are double-sided so that they can be seen in either direction. Some have the same information on the front and back of the banner, while others may contain two different images, offering different messages to those coming and going. 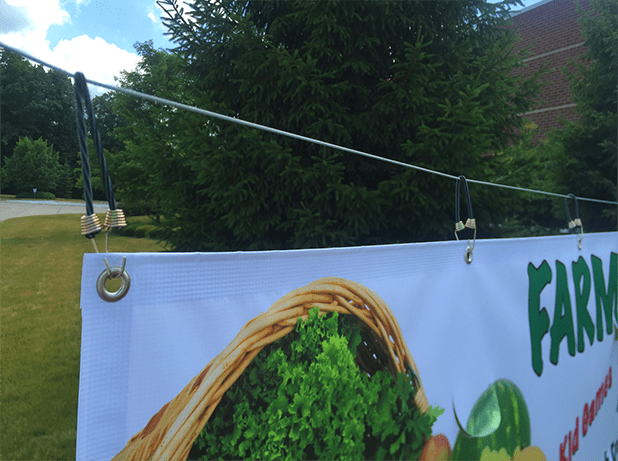 Single-sided over-the-street banners are less common but still effective - especially mesh banners - for over road use. Are over-the-street banners weather proof? These durable banners are made to withstand typical weather conditions like rain, moderate winds, heat, snow, etc. Over-the-street banners are meant to last through 3 to 5 years of continual outdoor use and can be used indoors indefinitely. For across-street banners, it is often best to run metal cables across the road. Once the metal cables are tight, the banner can be attached with snap hooks mounted across the top and bottom of the banner's length. 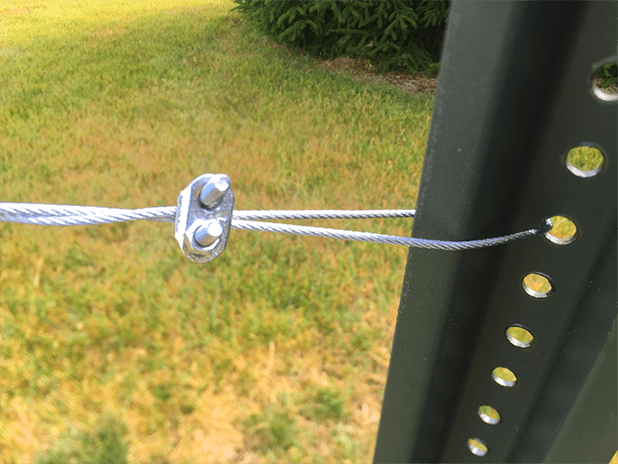 For stability, we also recommend attaching bungee cords in each corner, which attach to poles or buildings on either side of the street. In addition to providing stability, the corner bungees prevent the banner from sliding back and forth along the wires. Must apply for, and receive, a valid permit from the city. Every city may have slightly different codes for installation, display and maintenance of over the road banners. There is no such thing as a “normal installation” when it comes to suspending large banners over roadways. When hanging a banner over the road, it is important to use the proper supplies and materials. Using alternative supplies and taking shortcuts during installation not only negatively affects the length of time the product can be safely displayed, but it can also be dangerous. When installing banners that will hang over a street or between two poles or posts, it’s very important to be installed properly to ensure that the wind load is evenly distributed across the length of the banner to ensure that it will last. The banner needs to be tightly secured between two high tension, aircraft-grade cables that run across the top and the bottom of the banner between the poles. Banners will feature grommets installed into the hemmed edges to provide a superior bite and excellent durability. Each grommet shall have an inside diameter of 3/8 in. and shall be installed minimally 3/4 in. from outside edge and not more than 1-1/4 in. from top edge. Banners must have wind slits of sufficient size and number to prevent wind damage to the banner and hanging mechanism. Maximum banner length is usually 40 ft. (D-ring to D-ring along the top edge). Maximum banner width (height) typically cannot exceed 4 ft.
Because this is an example, we won’t actually be getting permits and hanging a banner over a road. We will use the right materials and some imagination to spread the message of how a banner is properly displayed over a road. For this exercise, we have selected two poles that are approximately 12’ apart. The poles have been tested and are very sturdy, providing excellent stability for our installation of a 2’ x 7’ vinyl banner. 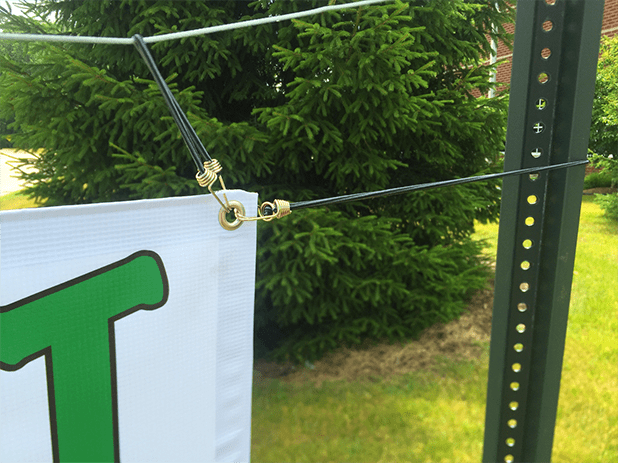 Using high tension, aircraft-grade cabling (found at any hardware store), a banner support system is created by fashioned by stretching tight a cable below and above the banner. These cables need to be stretched as tightly as possible, creating an extremely sturdy hanging element. The banner is attached to the tight cables on bottom and top, ideally using fasteners such as bungee cords or springs because they help to keep the banner stretched tight and wrinkle free. Alternatively, zip ties can be used if you do not have access to more “stretchy” fasteners. Once the banner is secured on top and bottom, additional support bungees are added to the sides in order to prevent the banner from sliding from side to side along the main cables. 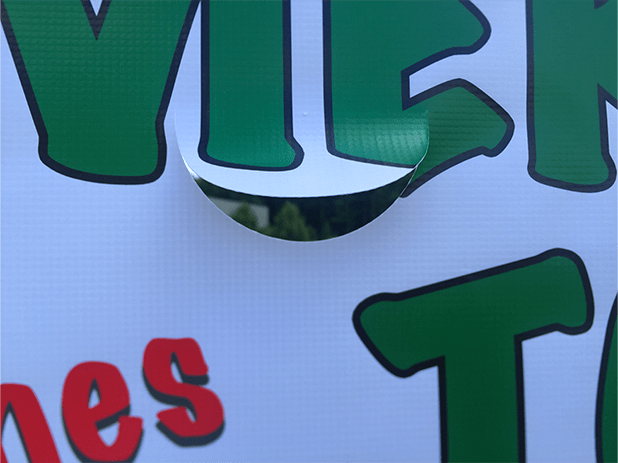 The side supports keep the banner centered over the road and help to eliminate any wrinkles, keeping the banner stretched and highly readable. In order to prevent the banner from becoming a giant sail over the road, it is highly recommended to cut wind reliefs (also called wind slits) into the vinyl material. The small, half circle slits allow wind to pass freely through the banner, reducing stress placed on the material and reducing the amount of wind related strain on the support poles. If your banner is made from mesh material, you can skip this step, as the banner is already designed to minimize the negative effects of wind. Now that your banner is approved by the local government and safely & securely displayed over a roadway, your message can start to be delivered to passing motorists and pedestrians!